This is the beginning of my build, as I just pulled her out of storage this past weekend. I've had this car since 1977, bought as second owner with 51k miles on it. I drove her all through high school and a few years after when I decided to use it as an occasional Friday and Saturday night cruiser. I pulled the original 351 2v Windsor and installed a 351 Cleveland. After a few years and a few motors I put her in storage just prior to joining the Air Force. 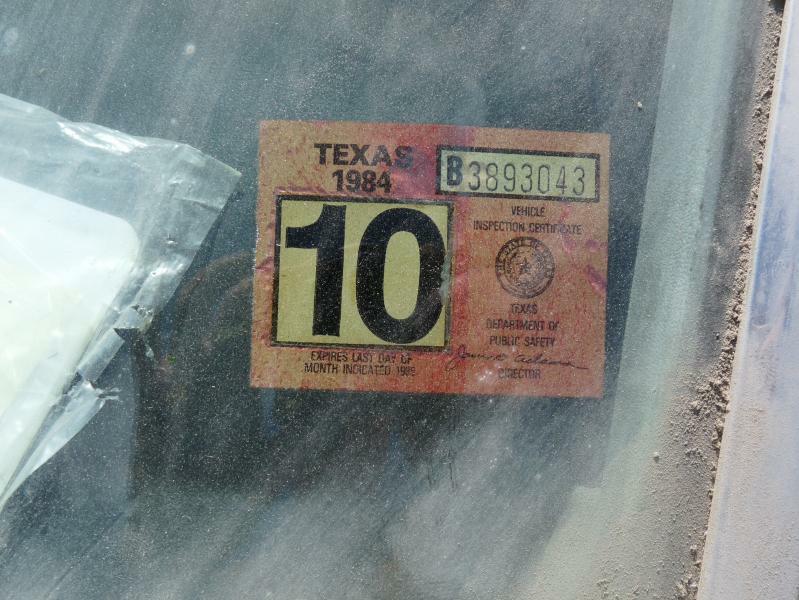 As you can see from the inspection sticker, it's been in storage in at least four different storage units in two different states since 1984. Raising two children, acquiring a degree and building a business has taken much time from me, but I've finally arrived and this is the day. I wished I had all the money that I spent on keeping her in storage, not to mention dragging her to several locations over the years, but this car has always been special to me and as you will see fated to be mine. Let me explain. I grew up in San Antonio Texas. Occasionally, during the summer months when we were out of school, my father would take us to the nearby mall for dinner. I was about thirteen then and in the parking lot of the mall was this gorgeous Mustang. I would look for it every time we went to the mall and more often than not it was there. Eventually the day came when its respective owner moved on and subsequently the car went with him. Fast forward three years, I'm seventeen stocking shelves in an Albertsons and needing a ride. I've got some money in the bank and am routinely searching the Sunday classifieds for my dream car. 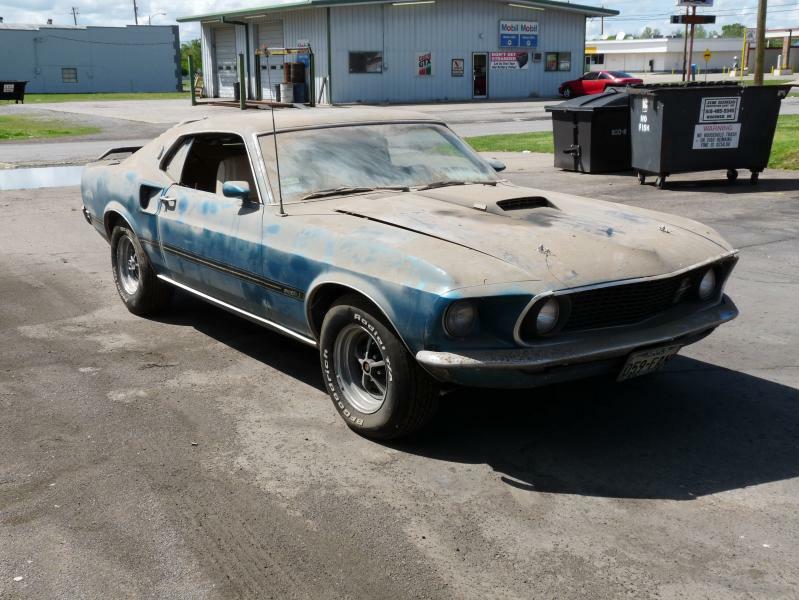 Eventually, I come across an ad listing a 69 Mustang Mach 1 for $1,100. I showed dad the ad, called the owner and hopped in the old Country Squire Station wagoner for a cruise across town to take a look. As we rounded the corner to the owner's house I could see the car in the driveway and noted that it was the same color as the car that I remembered at the mall a few years back. As we pulled up into the driveway, I realized, "that is the car that was at the mall!". I was freaking out and my dad was telling me to maintain some composure as he had plans to haggle with the guy. After the generous nine-hundred dollar offer was declined, I blew it by screaming, "It's my money, just give him the $1100". Again, that was 1977 and I've had the car ever since. Over the past several years I've been watching many of you and your builds come to fruition here and you have been such an inspiration to me. Many of you don't know it, but I've learned so much from so many of you and as such I hope you'll join with me here as I go through my very own resto. I've been looking forward to this for a very long time. 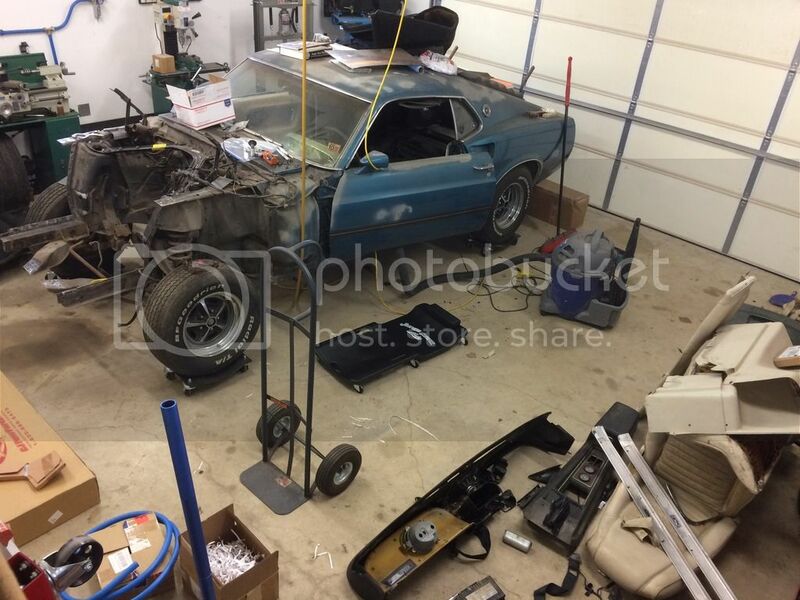 Welcome to the club of long term mustang projects. Looks like a good solid car. Bought my 69 in 83 when I was stationed at Blytheville AFB. I drove it regularly after transferring to Grissom in 84. I started tearing it down in 86 and it hasn't been on the road since. Moved it a couple of times after I got out of the AF. Have been working on it regularly except for recently as now that the kids are grown, I'm now taking care of my elderly parent's affairs since moving them to assisted living. Life just never stops so I take the opportunities when I get them. Yes welcome to the long term rebuilders club! You want to double your money on the car??? :) It sure looks like you have a solid base to start with. So is San Antonio still home? What are your plans to do to your Mustang? Welcome, great story behind the car. That looks like a very nice place to start. It is cool that you have had the insight to keep the car instead of selling it off. I drug a '69 Sportsroof all over Hill AFB area (north of Salt Lake City UT) and have worked in several storage building areas due to the never ending moving during my stent in the AF. What kind of plans do you have for the Mach? This will be an interesting journey as there is a lot of good memories tied to the Mustang and the cool vision of it outside "the Mall". Thanks for the kindly words, friends. I forgot to show the 1984 inspection sticker in the post above. That was the year I put her in storage. I no longer live in Texas, rather Oklahomaâ€¦.small town south east of Tulsa. As to my plans for the car, I will be resto-modding her, much like Buckeye did with his. In fact, Iâ€™ve been following his build since the very beginning. Of the 250,000 plus views he has, Iâ€™ve contributed about 20,000 of them. I want the car to look essentially stock but with some minor modern amenities and performance enhancements. 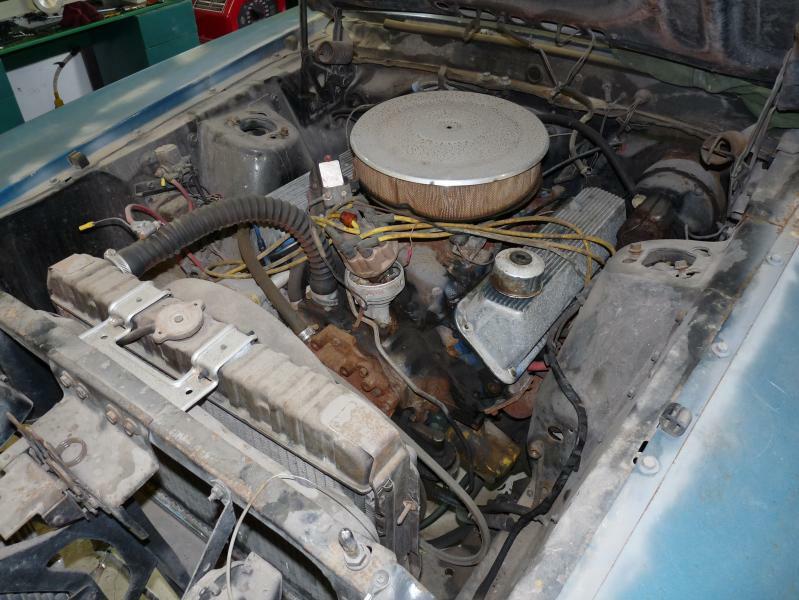 The car will receive a full rotisserie restoration and repainted in Gulfsteam Aqua. 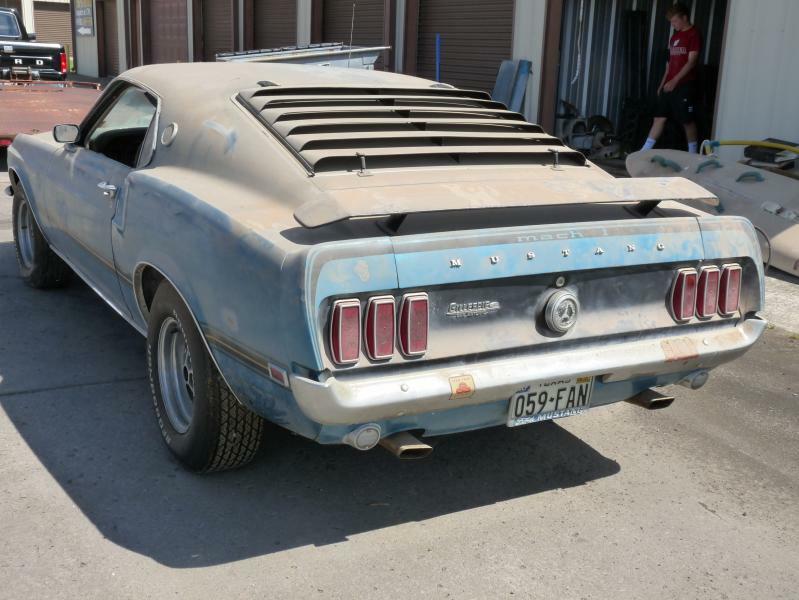 The only deviation from the factory Mach 1 paint scheme will be a blacked out trunk and rear tail light panel. The car has always been that way and I just like it better. Sheâ€™ll sport some 15â€ Magnum 500â€™s as well. Ohhhh, I will also be going with a shaker. 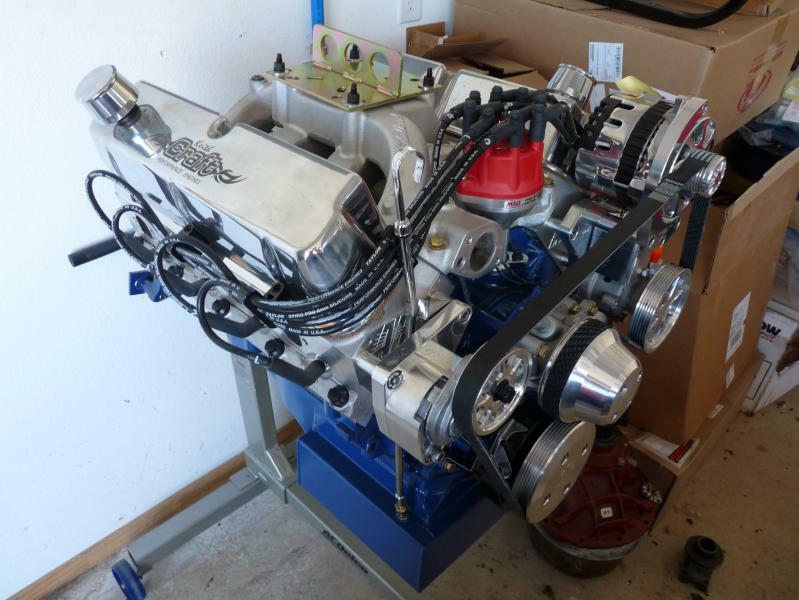 For the drive train, I have a Keith Kraft Racing built 408 stroker motor pictured below. A modified TKO-600 will be mated to it and that power will be delivered to a Jack Roush built Detroit locker with 389 gears. Iâ€™ve been buying parts for this car now for at least five years. The wife would kill me if she knew how much money Iâ€™ve spent on those parts. Some of you know what Iâ€™m talking about too! Here's a couple pics of my acquisitions! That is funny ,my gulf stream aqua 69 has been parked since 1984 as well .It was in the garage until about a year ago when i had to move it into a car port. Nice looking car Machspeed . Looks like you're off and running in the parts department. Nice looking car. I live about 5 min west of Tulsa. yet another '69 Gulfstream Aqua build. Mine hits the road on Friday. Seven years ago it was a bare frame. Fantastic, I checked out your build.....very nice! That's a Lazarus, buddy!!! Glad to see that car resurrected and looking like it does. You're fortunate to have a father-in-law that has the talents he does. I can tell you right now, for me, that hood and that trunk lid would have been sold for scrap metal. Impressive work. Tell me about your Magnum Wheels.....brand and sizes? Just a little work accomplished this weekend. Cleaned out the trunk and pulled the front and rear bumpers. These will be sent out for chroming. Jeez, I can't get over how much it cost to re-chrome things today. Removal of that front bumper was a bearâ€¦.a few minor cuts, some busted knuckles and a few colorful metaphors and it was done. Next in order is to remove the existing power plant. This is a 400 Ford I pulled out of a 71-72 LTD. The previous motor was a 351 Cleveland that I blew racing. Needing something to just move the car around, I purchased an LTD with some body damage for $150, removed the drivetrain and sold off the body for scrap. If I remember correctly, I got my $150 back out of the salvage. This engine ran when I had it in my car. It has not been started since I parked it in 84. I need to sell it. Thoughts on what it might be worth and best way to go about that? Been working on the Mach a bit. Removed both front fender aprons and the radiator support bracket. 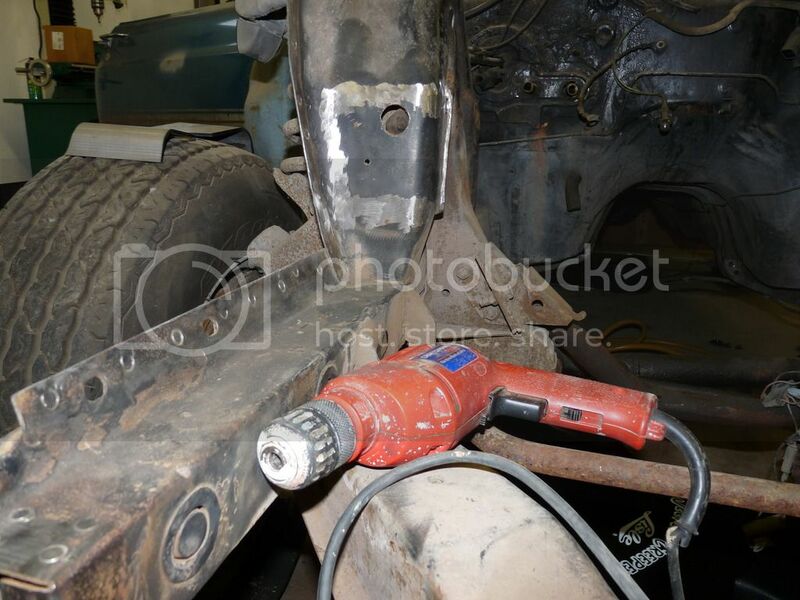 The car had been damaged on the driver's side years back and the shop that repaired it did a poor job with that particular apron and the radiator support bracket, thus the need to replace. 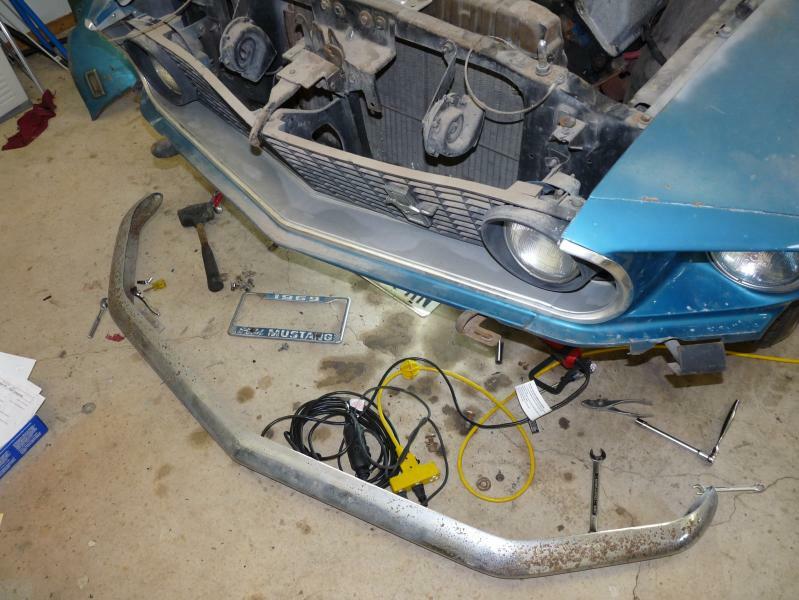 The passenger side front fender apron was rusted out from battery acid so needed to replace that too. 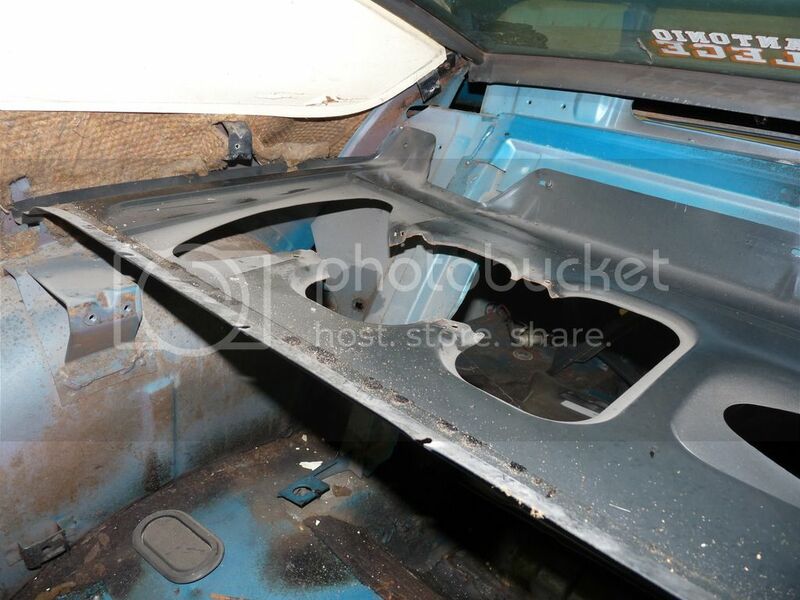 I have a small area on the rear driver's side qtr panel back behind the wheel that will need to be cut out and I'm hopeful that will be all the metal work I will need to do. 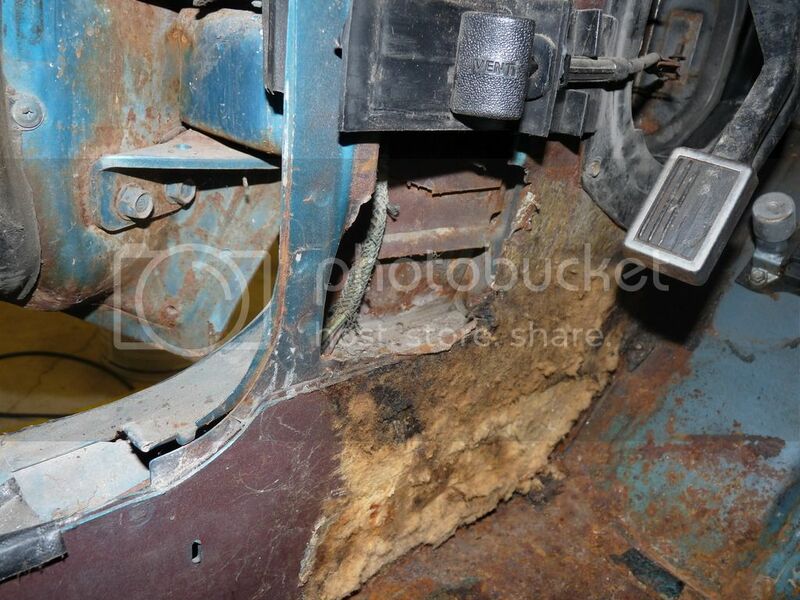 Also removed the interior. The plan is to weld on some shock tower support brackets then tie the front end together with both aprons and the radiator support bracket. Following that, I have some Tinnman subframe connectors I need to weld on and then the complete dismantling of the car for the rotisserie. A few regrets from years back. What the hey was I thinking....access ports for greasing the zerk fittings on UCA's. Hey, least I didn't use a torch! And that drill pictured was the very drill I used to do the damage all those years ago. Best dang tool I've ever owned. Must be thirty plus years old. Speakers, had to have some 6x9 placed back there on the rear shelf. I remember this venture, as I nearly bleed out with all the cuts on my hand trying to manipulate the jigsaw I was using. There's still dried blood in the jagged metal. And this is what really kills me...... access for more speakers. I gotta figure out a way to fix this mess. Well of course I love your build. Gulfstream Aqua with a white interior just screams out summer sun. I note that your tail light panel is blacked out. Is that factory or a change? I know the Boss 302 cars had that, but I don't remember if any others had that as a factory option. "Gulfstream Aqua with a white interior just screams out summer sun. ".....Wow, that is exactly how I have always felt when looking at the car! The blacked out tail panel and trunk lid are Boss 302 specific. When I bought the car, it had been done by the original owner. I liked it and kept it that way. I'm really struggling as to whether I want to go back to it or black it out again in the repaint. I may poll it when the time comes....lol! Thank you.....nice Gulfstream Mach you have as well. Will you be putting the decals back on it? I hope to put the decals on at some point, but I want to wait until I take care of a few issues. My car is very "originalish" looking other than the brake upgrade which pushed the need for those rims. In going with that, and the look of the car, I was thinking of getting my decals done black on chrome. Nobody else has that, so it would look original but be unique, like my car. I've really enjoyed reading about your history with this Mach 1. Its great that you have hung on to it all this time and can finally restore it. It will be a beautiful car when you're done, I'm sure. It is neat to see the old Gillespie Ford of San Antonio emblem on the tail panel. My older brother was a salesman there in the 60's and early 70's and he sold a lot of Mustangs over the years. He could have been the one who sold your car to it's first buyer. Good luck with your build, I am looking forward to following your progress. Thank you! The owner told me that he bought the car brand new off the show room floor there at Gillespie Ford. If that is true, I suspect your brother laid eyes on the car. Sadly, Gillespie Ford is a thing of the past. I found that out when I was looking for them in hopes of acquiring a new emblem, as the one on my car is pitted. 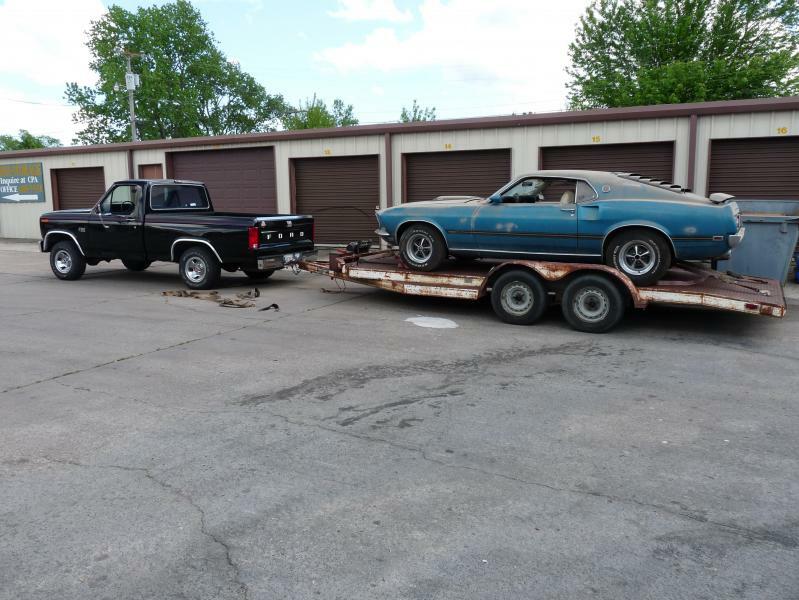 If that is your Grabber Green Mach one pictured in your avatar, you have a very nice car as well. Don't see many Grabber Green cars. I also had a Grabber Blue 70 Mach years back. It was loaded. Had everything you could put on the car. Wished I'd kept it. Funny how so many stories are similar here... mine bought a year later.. put away about a year earlier.. you're doing it right.. can't wait to watch the build.. I am sure my brother did have some contact with your car, especially if it passed thru the showroom there. Its sad that Gillespie Ford is gone now. In the 60's, that was a nice dealership that stocked some really interesting Fords. I can remember seeing Bosses and Shelbys as well as Mach 1's in that showroom back in the day. I love the Gulfstream Aqua color of your Mach 1. It will be an attention magnet, especially with a tuxedo interior. Red and Black cars are neat but very common. I like to check out the other color cars at shows I attend so I can see something different. Thanks for the compliment on my '70. It is indeed Grabber Green and oddly enough, has Dark Ivy Green interior. 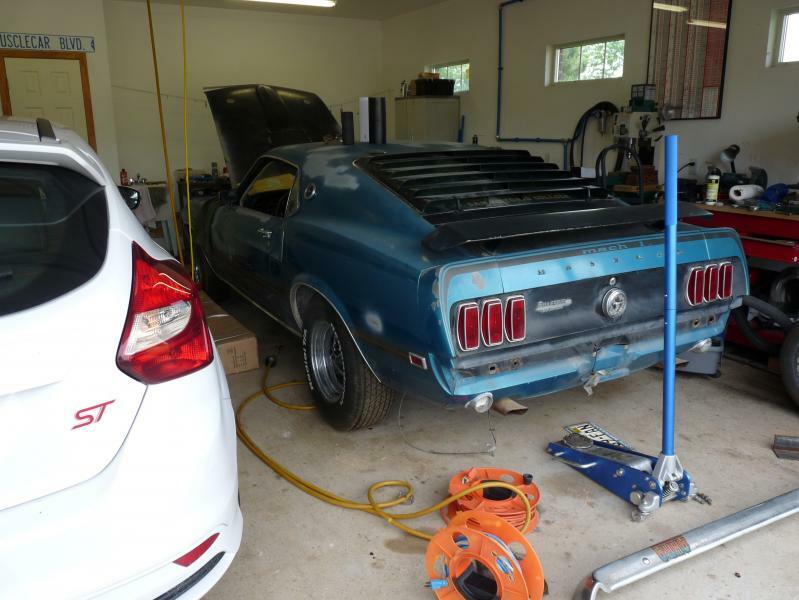 According to the Marti Report, it is one of only six 1970 Mach 1's built in that combination so I guess it is kind of rare. 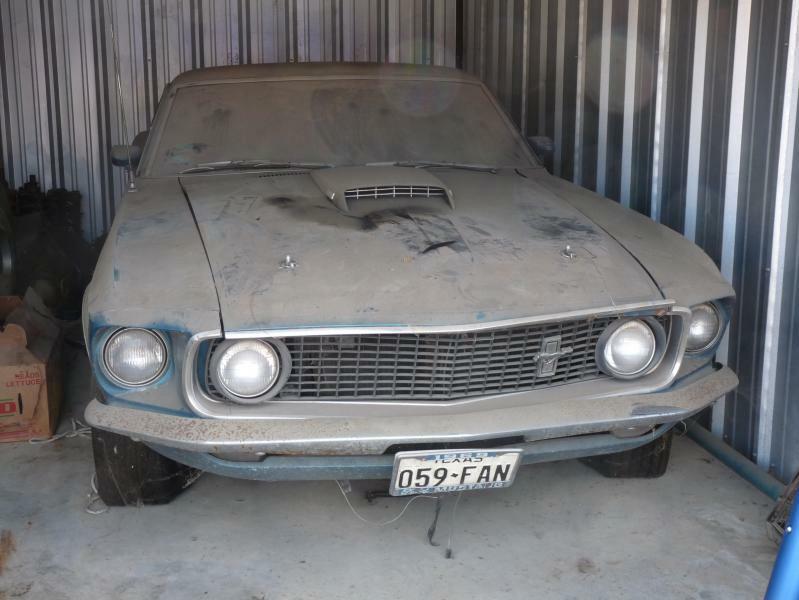 It is the only one currently listed in the Mach 1 Registry. Right now I am finishing up a three year restoration on it to make things right and can hardly wait to get back on the road with it. I've been working a little. I try to do a little bit every day after work, no matter how tired I am. Anyway, welded up the shock tower support bracket, front and reat of the towers. Following the shock tower support brackets, I finally welded up both front fender aprons and the radiator support bracket. This was a bit tedious, as I measured and measured and measure...you get the point. When I was finally content with the measurements and fit up, I used sheet metal screws to secure it. I then removed all clamps and tossed the fenders and hood back on to make sure it would line up properly. It did! The welding was the fun part....finally! And to finish up the structural, I welded my Tinman subframe connectors on. I have to admit, I really thought twice about cutting open the back end of my frame rails to accommodate those subframe connectors. But, I like the look and they provide some serious support to the chassis and body of this car. Prior to welding up the sub frame connectors though, I sprayed the insides of my frame rails with an Eastwood rust encapsulator. This Eastwood product comes with a long hose and a tip that is able to spray 360 degrees. To test it out, I actually utilized it to sprayed inside my subframe connectors. This also to give me some idea as to the rate of pull of the hose for best coverage. I was quite pleased with it. Prior to install, I also sprayed the tops and sides with SPI Epoxy primer. 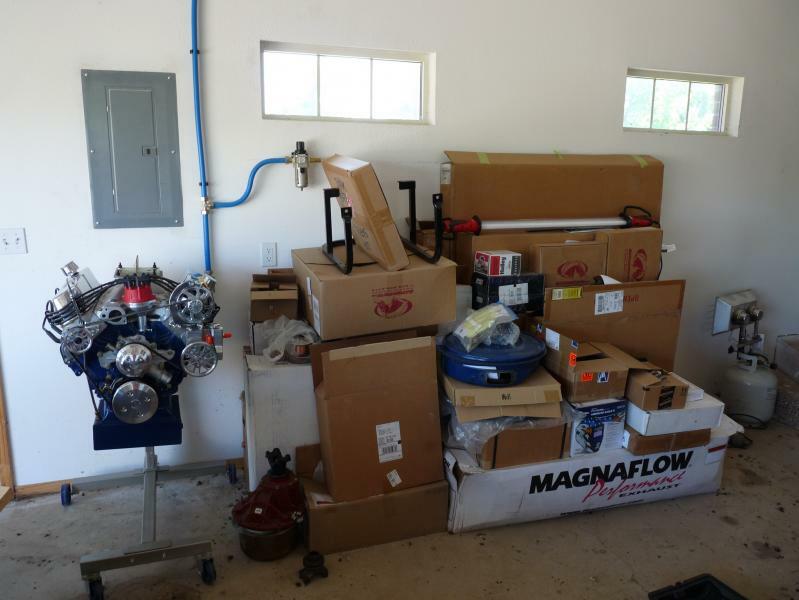 Now with all this finally done, I can begin the full disassembly of the car! Anybody in Oklahoma with a rotisserie I can barrow or rent? I have plans for one but I just don't want to consume my time building one when I'm only going to use it once!